Commercial carpet cleaning improves the appearance of your business and helps maintain the health of your customers, clients and staff. Has it been over a year since your last commercial carpet cleaning appointment? If so you will want to schedule an appointment with Chem-Dry by the Millers very soon. The Carpet & Rug Institute recommends annual deep carpet cleaning for storefronts and businesses. 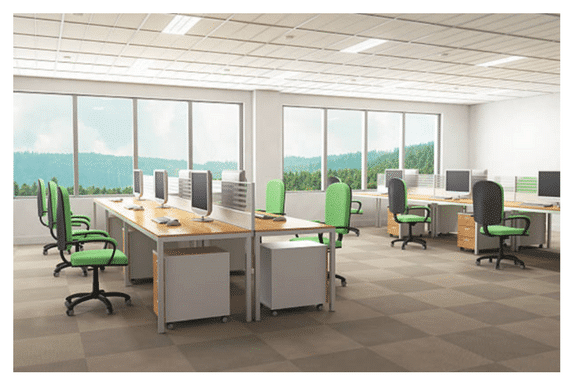 Commercial carpet is subject to a lot of traffic and needs more attention than residential carpet. In terms of carpet, rugs and upholstered furniture in businesses, it depends on the level of traffic and the type of use they get. If they get mild use, twice a year might suffice. But if they get heavier use or are more prone to allergens and/or bacteria, it’s recommended to have them cleaned every few months or even once a month. How often you schedule carpet cleaning depends on the level of traffic within your business. If the rugs and carpet and upholstered furniture receive minimal traffic than twice a year is fine. If you own a carpeted restaurant or storefront with hundreds of customers every day or a corporate office with hundreds of staff members you might want to consider monthly carpet cleaning. Even if your commercial carpet doesn’t appear dirty, you still want to schedule a carpet cleaning service once a year in order to remove unseen, embedded dirt, contaminants and allergens from the carpet fibers. Is your carpet really that clean? The carpet in your business might not appear dirty but it still is. You will want to schedule commercial carpet cleaning to remove unseen, embedded dirt and contaminants and allergens from your carpet fibers. Carpet is never 100% clean until it has been professionally cleaned. There are many benefits of Chem-Dry by the Millers carpet cleaning to consider for your business. Our commercial carpet cleaning service improves the appearance of your carpet, protects your investment and prevents allergens that could be harmful to the health of your customers, clients and employees. Not all dirt is on the surface of carpet. Some dirt is deeper and embedded within the fibers. Embedded dirt can cause permanent wear and tear and soiling will become visible on the surface over time. Embedded dirt that is ignored ruins carpet to a point where it cannot be cleaned or repaired. The dirt continues to be grinded into the fibers and breaks down the resiliency of the carpet. The cost of replacing and installing carpet for a business is much higher than the cost of commercial carpet cleaning. If you choose Chem-Dry by the Millers you can be confident that all embedded dirt will be removed and the lifetime of your carpet will be extended. Avoid carpet shampooers or steam cleaning services for your business. Those carpet cleaning methods subject your carpet to too much water, soap and sometimes harsh chemicals. Too much water can saturate carpet and lead to mold and mildew growth. Soap is a magnet for dirt and if left behind will create a soapy residue that leads to increased soiling on the carpet surface and chemicals come with their own unique potential for permanent damage. Water can saturate and damage carpet. Wet carpet can breed mold and mildew too. Soap is also bad for carpet. It can become a magnet for dirt and cause further soiling. It is worth investing in the drier, cleaner and healthier commercial carpet cleaning that Chem-Dry by the Millers provides in order to protect your carpet and guard against permanent damage. Commercial carpet cleaning does more than improve the appearance of your carpet. It also offers health benefits and provides allergy relief. Carpet, rugs and upholstery can act as giant air filters that trap allergens, bacteria, dust and pollen. It is good that they’re not circulating in the air you breathe but you still don’t want them to be in your business. A recent independent health study found that Chem-Dry’s Hot Carbonating Extraction (HCE) process removes an average of 98% of common allergens from carpets and upholstery and, when a sanitizer is added, 89% of airborne bacteria, improving indoor air quality*. Employees and staff that suffer from allergies will be happy to hear you’ve chosen Active Chem-Dry. Professional commercial carpet cleaning should complement routine cleaning. Daily maintenance and care is essential to the health of your carpet. Did you know that 90% of dirt is brought in from outdoors on the bottom of shoes? We recommend you place doormats at entryways and exits of your business. Doormats prevent outdoor dirt and particles from reaching your carpet. Daily vacuuming is also important. Be sure to hire a professional cleaning service that vacuums every morning or night. It is the single most important chore for maintaining carpet. Chem-Dry uses 80% less water than steam cleaners and carpet shampooers and no soap or harsh chemicals. Our Hot Carbonated Extraction (HCE) system has been awarded The Carpet & Rug Institute Seal of Approval and is industry-recognized among the best carpet cleaning methods. The Chem-Dry by the Millers carpet cleaning process combines green-certified cleaning solutions, in-depth training and world-class equipment to provide drier, cleaner and healthier carpet cleaning in Southeastern Pennsylvania and the best results for your business.